Tye Tribbett first came to national attention in 1997 when he entered his group, GA, into the McDonalds and Wrigley's Gospel choir competitions, where they "swept the competitions," winning first place in all categories. The group quickly became highly in demand, performing with music industry superstars Gloria Estefan, LeAnn Rimes, Elton John, Luther Vandross, and Stevie Wonder. They also appeared with Jill Scott, India Arie, John Mellencamp, Musiq Soulchild, and The Roots, among many other artists, and toured with Faith Hill and Don Henley. Tribbett and his group performed "Let Go, Let God" on the soundtrack of the Dream Works animated film The Prince of Egypt with award-winning duo Mary Mary. His highly anticipated debut album, Life (2004), brought Tribbett and his group, GA (Greater Anointing), a wide array of new fans and a Stellar Award nomination. Tribbett's sophomore project with GA, Victory, was released in 2006, debuting at #1 on Billboard's Top Gospel Albums chart. This break-out project, which included the #1 gospel radio single, "Victory," received three Stellar Awards, three GRAMMY® Award nominations and a Dove Award nomination. His third release, Stand Out (2008), again topped the charts and earned the group another nomination for a GRAMMY® Award. In 2009, Tribbett, who is also an accomplished musician who plays multiple instruments, retired GA and made other changes in his musical style and direction, resulting in the 2010 release of the aptly named Fresh. The CD, which the Washington Post called "a wondrous album," also entered Billboard's Top Gospel Albums chart at #1. Tye Tribett is set to release his fifth and highly anticipated album Greater Than. With a career of groundbreaking and chart-topping, albums, hit singles and career achievements. Tribbett's musical style, has always been considered forward and refreshing, he is a true talent and amazing stage performer. His ministry speaks to the heart of a new generation and his uniqueness is unmatched and unparalleled. From the opening performance of his new single, "Same God," at the 28th Annual Stellar Gospel Music Awards Tribbett received rave reviews and a standing ovation. His upcoming album Greater Than is set to be a fan favorite and placing Tribbett's newest release where he is known to be, next level. 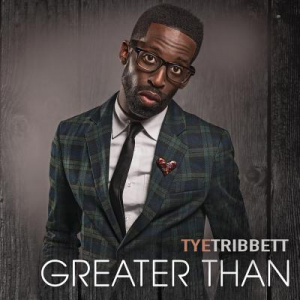 Greater Than by Tye Tribbett was published by EMI in August 2013 and is our 18907th best seller. The ISBN for Greater Than is 5099972195727. Be the first to review Greater Than! Got a question? No problem! Just click here to ask us about Greater Than.